Sneaky's Chicken is part of a long running tradition of fried chicken places with raccoon mascots. Who among us can honestly say they would drive past a fried chicken place with a big raccoon on its sign. 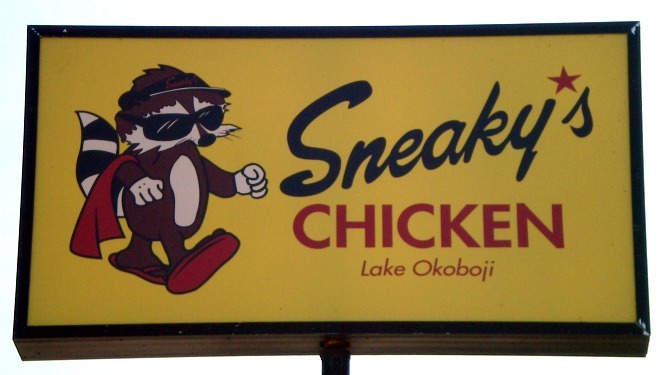 For their new location near Okoboji, Sneaky's added sunglasses, a visor, beach towel and most importantly sandals to its raccoon mascot. Location: 293 Hwy 71 North in Arnold's Park, right off Lake Okoboji in Northern Iowa. Directions: Highway 71 is the main drag into Okobji, and Sneaky's is just south of the bridge across the lake. 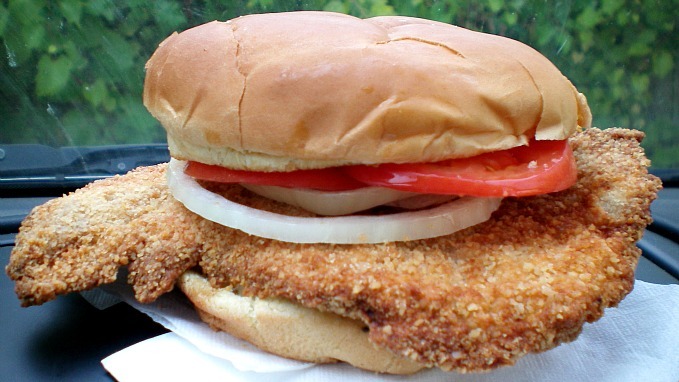 Sneaky's Pride: This sandwich is described as "famous" and "hand breaded" in its description. 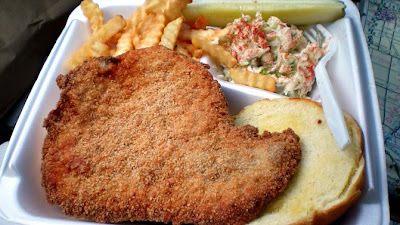 It felt like seven ounces of pork meat in the classic mitten triangle shape. The meat was cut with the grain and a little on the thin side. 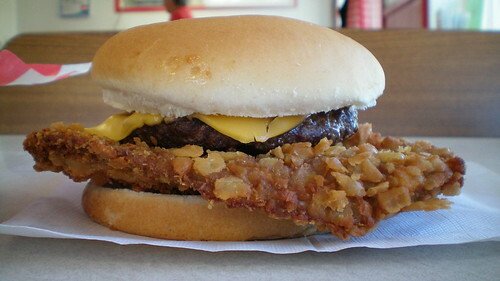 The texture was a great hard crunch on the outside with chewy and dry pork inside. I can't help but think this is the same kind of breading they put on their fried chicken. Served on a huge toasted bun. Overall 7.0 out of ten. 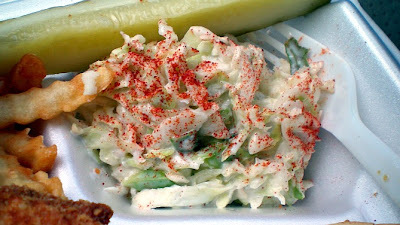 Price: $8.99 with two sides and pickle slice. Also on the menu: fried chicken, side items, fried chicken, fish, fried chicken, burgers, fried chicken, chicken gizzards, fried chicken, sandwiches, fried chicken, and catering or picnic size orders of fried chicken. Service: I came in during the off hours and went straight to the take-out counter. I think its table service for dining in or on the patio. Ambiance: This is a newly remodeled space that was just recently turned into Sneaky's. I don't know what was here before, but the dining area was open and bright, and you might be able to see the lake from the corner of your eye from the patio. I snuck out of this place without getting a picture of the building. Final Thoughts: The Sneaky's Chicken location in Sioux City is in more of an older roadside fast food style of building several decades old. I saw the menu board there and it only listed Sneaky's Pride, and I didn't put together that that was the name for their tenderloin. I haven't written up many sandwiches in this part of Iowa because I don't make it that often. Sneaky's was only my second choice after another place was closed. I'm sure this place gets busy during the summer months when the lake is packed with families. I keep wondering which part of the pig is shaped like a mitten???? Its the same butterfly cut of pork loin that get pounded out and sometimes it has a little finger or thumb shaped projection on one side. I may need to think of a different way to describe it when the meat looks like a catchers mitt. 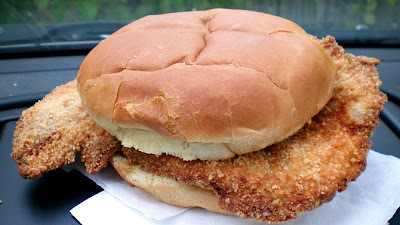 Nearly ever sandwich here is pork loin cut then tenderized, breaded, and fried in that order. This place used to be a pizza restaurant. And I think I can speak for most of the locals when I say we would rather have the pizza place baack. I used to get chicken all the time at the Sioux City Sneaky's, and it was a consistently high-quality product (didn't explore much else on the menu though). Does any chicken in AP/Okoboji really compare to this, and do they offer a pork tenderloin? Also--I don't know what pizza place used to be there, but what the area really needs back is Rio Pizzeria. You can search far and wide but not find pie with that much flavor and personality.